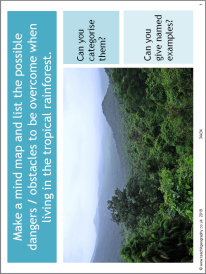 A resource encouraging students to consider what life would be like in the tropical rainforest. They use a range of rainforest characteristics cards to consider and design a way of life to survive in this environment. Literacy objectives are included in this lesson to develop their written skills.